In the midst of 2011’s Arab uprisings, thousands of tear gas canisters bearing the conspicuous “Made in U.S.A.” designations became a symbol of U.S. support for authoritarian regimes and violent repression of peaceful dissent in countries like Bahrain, Egypt and Tunisia. While U.S. transfers of crowd control items like tear gas are sometimes viewed as encouraging a non-lethal approach to protests, the regimes' excessive and improper use of tear gas have caused cases of serious injury or death. In response, Congress has sought to better control such transfers, but the gaps in such controls are growing to an alarming level. After U.S.-supplied tear gas was used in Bahrain, then-Senator John Kerry said, "Using tear gas, batons, and rubber bullets on peaceful protestors is the worst kind of response to a nonviolent demonstration." This concern made its way into a U.S. law (the FY12 Consolidated Appropriations Act).Under the law, the Secretary of State must report any transfer of crowd control items to states with a history of using excessive force to repress dissent and should consult with the U.S. Committees on Appropriations prior to obligating funds for this purpose. Since then, language has remained in place to restrict Foreign Military Financing (FMF) funding from being used “for tear gas, small arms, light weapons, ammunition, or other items for crowd control purposes for foreign security forces that use excessive force to repress peaceful expression, association, or assembly in countries undergoing democratic transition.” As highlighted in a recent Project on Middle East Democracy (POMED) report, the FY16 Senate bill seeks to renew this restriction. Despite the admirable legislative action, there are some important gaps in U.S. law that allows the United States to transfer tear gas and other crowd control items without added restrictions. The restriction does not apply to U.S. arms sales to foreign countries through Foreign Military Sales (FMS) and Direct Commercial Sales (DCS). Nor does it apply to other non-FMF security assistance programs. In the months leading up to the ouster of Egypt’s former president Mohamed Morsi in 2013, U.S.-based Combined Systems, Inc. shipped 70,000 tear gas grenades and 70,000 long-range cartridges to Egypt despite the country’s police force’s record of using excessive force against protestors. The Egyptian government continues to abuse tear gas under the Sisi regime, as security forces have fired it at university students, activists, and into vehicles that on one occasion resulted in 37 deaths. 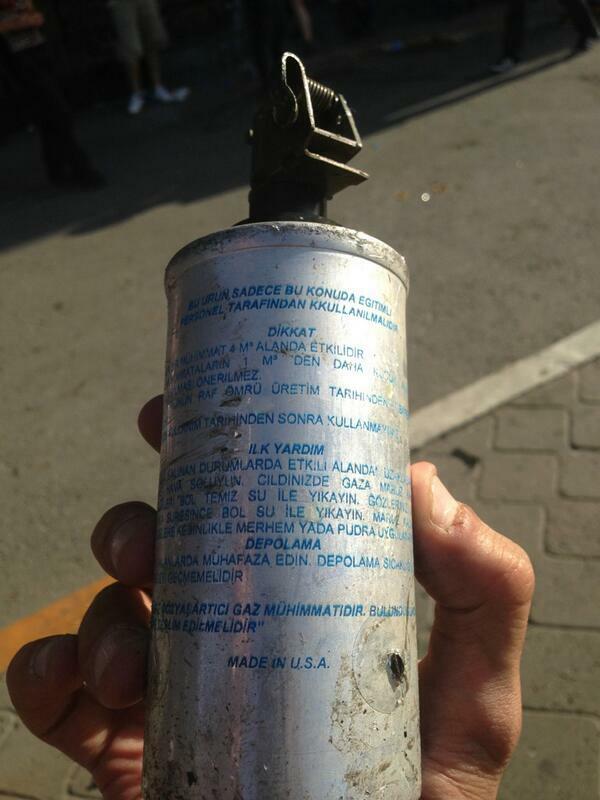 In Turkey, where a 15-year-old died from being struck in the head with a tear gas projectile, tear gas canisters produced by two different U.S.-based companies were recovered in Gezi Park. While tear gas is banned from warfare under the Chemical Weapons Convention, its use in civilian policing has expanded rapidly, due to the growth of the global non or less than-lethal market. For years, the United States has divided the export licensing oversight for crowd control items between the State Department and Commerce Department, depending on whether an item was designed to be for military or civilian purposes. However, due to a recent State Department proposed change to U.S. arms export regulations, all tear gas may soon be licensed through the Commerce Department, which means there will be fewer checks on U.S. exports of tear gas. If implemented, there would be less public reporting for most countries and some countries, like Turkey (as a NATO country), that have abused tear gas in the past will be able to purchase tear gas without any U.S. government control. As legislators in the United States continue to restrict the transfer of tear gas to Middle Eastern countries because of concerns about their misuse of them, it must be recognized that an increasing amount of loopholes is undermining their intentions. Moving U.S. oversight of tear gas transfers over to the Commerce Department may be a clear sign that more action by Congress is needed to protect U.S. interests. The civilian-military distinction depends on the toxicity level of the chemical agents in the tear gas canisters: if it is one percent or less of the active ingredient, then it will not be considered a military-grade item.